Manny Psihountas. Lawrence won the game, 20-17. SM South was able to pick up a key district victory, while also ending their five-game losing streak. The Raiders have now defeated Blue Valley North in each of the last four seasons. Blue Valley North actually got on the board first, knocking in an Emmerson Womble field goal to go up 3-0. SM South answered in the third quarter with a 33-yard touchdown run from Tyler Perdue, and led 7-3 at the half. In the third quarter Dalton Lewallen tacked on a 12-yard touchdown run to make things 14-3. Marshall Bland caught a 23-yard touchdown pass from Matt Hollingsworth in the fourth quarter, pushing the lead to 21-3. Blue Valley North's final push came on a five-yard touchdown pass from Joey Dolan to Cooper Lantefield. SM East set the record for points scored in a Sunflower League game with this effort, even despite the fact they pulled their starters after the first quarter. The Lancers scored 12 touchdowns, and they came, by quarter, as follows. First Quarter: 42-yard run by Wyatt Edmisten; 52-yard pass from Gunnar Englund to Jackson Gossick; 41-yard pass from Englund to Charley White; 28-yard run by Gossick; 35-yard run by Edmisten. Second Quarter: 30-yard run by Calvin Jones; 50-yard run by Mike Banford; 12-yard run by Luke Kaiser; 10-yard run by Parker Shirling. Third Quarter: Two-yard run by Jackson Lovelace. Fourth Quarter: four-yard run by Tommy Barreca; 15-yard run by Carl Young. The game started with the teams exchanging field goals, SM Northwest's coming from Jonathan Killeen and SM West's from Tyler Thayer. Midway through the second quarter SM West went ahead 10-3 on a three-yard run from Tarik Watson. Then, just before the half, SM West faked a punt and Andrew Ferguson took the ball 47 yards for a touchdown to make things 16-3 heading into the intermission. A one-yard keeper from Adam Rellihan made the score 23-3 early in the third quarter. Next, Watson scored on a 21-yard touchdown run to make the lead 29-3. Late in the fourth quarter Asher Goldston intercepted a pass and returned in 85 yards for a touchdown to make the game 36-3. SM Northwest added a late touchdown run from Sam Sullivan to make the final score 36-10. The Falcons jumped out to an early lead (like always) and carried the momentum through for a huge district victory. Olathe South struck first on a 37-yard touchdown run from Jake Seurer to go up 7-0 early in the first quarter. Shortly thereafter, Seurer found Jordan Wall on a 31-yard touchdown pass to make the lead 14-0. A Zach Zegunis run before the end of the quarter made things 14-6. Olathe South answered with a 26-yard touchdown run from DaeVonte Nance to push the lead to 21-6. Seurer then connected with Jonathon Sands on a 58-yard touchdown pass to go up 28-6. Blue Valley Northwest kept things somewhat honest, adding a 10-yard touchdown pass from Zegunis to Dalton Schoen to make the game 28-14 at halftime. Zegunis found Schoen on a 33-yard touchdown pass in the third quarter, which pulled the Huskies to within eight, at 28-20. But Olathe South put things out of reach in the final quarter, adding a four-yard touchdown run from Nance and a eight-yard touchdown pass from Seurer to Cole Browning to claim the victory. This was just week one of districts, but it very well may have determined the playoff fate of both teams. Olathe Northwest got on the board first with a 27-yard Devin Antcil field goal in the first quarter. Toward the end of the first quarter, LHS added a 48-yard touchdown run from JD Woods to take a 6-3 lead. Olathe Northwest came back with the only score of the second quarter on a 10-yard touchdown run from Dominique Bruce. The Ravens led 10-6 at halftime. Woods opened the second half with an 85-yard touchdown run to put LHS back up, 13-10. Later in the quarter, Jack Hatzfeld tacked on a 14-yard touchdown run to put the Ravens back in front, 17-13. Woods proved to be the difference, however, adding his third touchdown of the day on a 76-yard touchdown run to give LHS a 20-17 lead. Both defenses held their ground in the second half, which resulted in LHS' fourth victory of the season. The Firebirds pushed their record back above .500 with this convincing victory. Free State led 7-0 at the end of the first quarter after Bryce Torneden closed out a drive with a one-yard touchdown run. Next, Khaury El-Amin scored on a 20-yard touchdown run to make things 14-0, before Torneden found Tye Carter on an 18-yard touchdown pass to extend the lead to 21-0. Paul Bittinger intercepted a pass and returned it 39 yards for a touchdown push the lead to 28-0. Before the half, Washburn-Rural got on the board with an eight-yard touchdown pass from Blake Peterson to Drew Lewis, making things 28-7. Torneden added a touchdown run midway through the third quarter to make the score 35-7. Washburn-Rural responded with a seven-yard touchdown pass from Peterson to Jovon Hall to put the game at 35-14. Free State closed the door with a 38-yard touchdown run from El-Amin late in the third quarter. 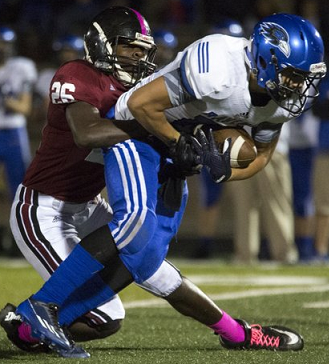 Leavenworth recorded a nice victory, their third of the season, to push their record to 2-0 against 5A competition. The Pioneers scored first on a six-yard touchdown run from Sanchez Williams to go up 7-0. Later in the second quarter, Isaiah Ross intercepted a pass and returned in 30 yard for a touchdown to make the game 14-0. In the second half the Pioneers would add a four-yard touchdown run from Williams, and a 27-yard touchdown pass from Landry Hodges to Ross to close out the victory. The Eagles found a way to get all of their playmakers involved in this one, as five different starters scored touchdowns. Meanwhile, on the other sideline, Olathe East continued an unprecedented midseason slide which has cast a shade of doom and gloom onto the program. Venus Triplett added two first quarter touchdowns of 52 and one yards to make things 14-0. In the second quarter, Marcel Spears scored on a 17-yard run, and then Isaiah Simmons added a 24-yard touchdown run. At halftime Olathe North led 28-0. Triplett added a touchdown to start the third quarter, making things 35-0, before Olathe East put their lone points on the board courtesy of a 36-yard Chris Diddle field goal. A two-yard touchdown run from Cole Murphy gave the Eagles a 42-3 advantage entering the fourth quarter, and they finished things off with a 12-yard touchdown run from Vinnie Shabbaz. No box score was reported. SM North finally snapped their losing streak, and in the process set themselves up for a likely playoff berth if they can win one of their remaining two games. Their next opponent, Harmon, stands at 0-7 on the season, and is coming off an 83-0 loss to SM East. The last touchdown scored during the Olathe South vs BVNW game was by #3 Cole Browning not #8 Devin Hall.